Can someone explain the point of this please? It looks awful. Assume half of the 'project' still needs completing. To develop race bikes for Team Kapriony. Essential mod: 2.6kg removed from the top of the bike. What’s the CCA on the lithium battery ? Enough to easily crank a GSA and then a 1290 and now a 790. Been round the block this battery! Doesn't suit the 1290 as much because the stupid keyless bit runs it flat in a few weeks (or less) although there maybe something else drawing current that I don't know about. The old GSA had keyless but the battery never went flat - must work in a different way I guess. I don’t think I’ve used lithium batteries, are they fairly deep cycle or do they need to be used to stay charged ? Looking at where the battery is mounted, removing the 2.5kg, is it noticeable ? Lithium batteries hold there charge for a long time. They don't love the cold. The good ones shut down before they're completely flat to prevent permanent damage to the cells I believe. I've fitted them to all my bikes that I've owned over a number of years now and not had a single issue apart from current drain on the 1290. The one on the Freeride has gone to hell and back in rain/snow/heat and continues to perform perfectly. The CCA of the JMT battery is claimed to be 210. I love the concept but note that 48 Wh on the lithium-ion battery works out at 4 Ah, compared to 10 Ah on the original. I understand what this means but not how it might impact us in real world use. Normal battery chargers will damage the battery, so you would need to buy a battery charger designed for LI batteries. 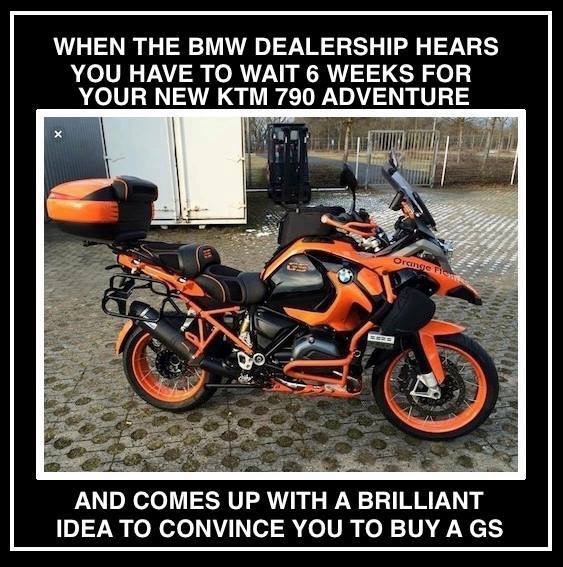 ...and presumably then change the charging system on the bike? Please note that only suitable battery chargers are used, such as the JMP 800, JMP 4000 or the corresponding workshop equipment. Please ensure that a compatible charger is used as a wrong charger will invalidate the 2 year warranty. For fast charging, we recommend the JMP 30000 workshop unit. With this a lithium-ion battery can be charged up to 90% within 6 minutes. For the maximum recommended charging currents please refer to the technical data below. In no case must chargers be use that have a de-sulphate mode for deeply discharged batteries (i.e showing 10 volts or less) These chargers use an output of more than 14.9 volts before they begin the actual charging cycle. The maximum charging voltage of 14.9 volts must not be exceeded in any case, as in extreme circumstances there can be a danger of explosion. *PLEASE NOTE IT IS NECESSARY TO USE ONLY BATTERY CHARGERS SUITABLE FOR LITHIUM ION BATTERIES WITH THIS PRODUCT. SOME TRADITIONAL LEAD ACID CHARGES CAN IRREPARABLY DAMAGE LITHIUM BATTERIES. PLEASE REFER TO YOUR CHARGER MANUAL OR SEE OUR RANGE OF LITHIUM SPECIFIC CHARGERS. Note that Lithium batteries can be difficult to revive if they are allowed to go totally flat so they are not suitable for total loss systems etc. Lithium batteries have different charging requirements to conventional batteries. Some conventional chargers will charge lithium batteries effectively and safely but there are specific compatibility issues such as maximum charge rate (Amps), charge capacity (Amp hours) and voltage. Check the specification of your charger and battery to avoid damage to the battery and safety issues. Overcharging or charging the lithium batteries too quickly can cause them to swell up and they can burst. If you are not sure that your conventional charger fulfils these requirements for your lithium battery, we have a choice of either the JMP4000 CANBUS lithium battery charger ACA90002 or the Ctek Lithium XS charger ACA66504 , which are suitable for most lithium batteries including all JMT and Aliant lithium batteries that we sell. Last night at the local bike meet one of the R models was parked up. I very much fancy it. This bike just looks right. It will have to be an additional bike not replacing one of the BMs.